BRAZIL, CUBA, GERMANY, JAMAICA, JAPAN, MEXICO, NIGERIA, UK, USA 1, USA 2. A 'teaser' collection (just 100 loops) of unique drum grooves from around the world; played by real live drummers. 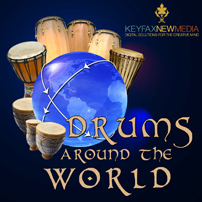 From Nigerian tribal rhythms to Taiko to Norteno, spice up your existing material with these exotic and unusual beats; use them as a springboard for your own grooves and songs, or use them as material for live backings.